A.L.S. 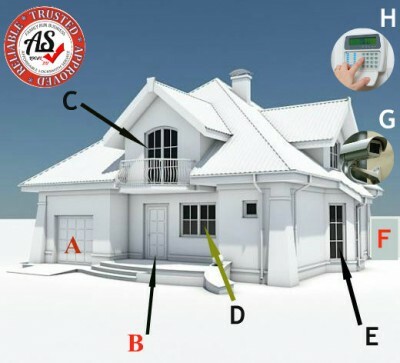 Locksmith Dumbarton and Glasgow are experts in home security issues and as such have compiled this guide to hopefully explain some of the home security issues that can effect the overall security in and around the home. As a guide we have provided this picture to our right to highlight some of the areas that warrant some thought as to there effectiveness as a deterent or stopping force to a would be burglar. The home is supposed to be our safe haven. Are biggest asset and most expensive. Its a place were are possesions we have built up through the years are safe, and more importantly, are family is secure. Once violated the home is never the same again. Here's what to look for and what you can do about it. Up and over garages are an easy target. Its surprising how easy they open with the right amount of force targeted at the right area. And yet home owners don't think twice about leaving there second most expensive asset in the garage when they go on holiday. Consider fitting keyed security bolts to the garage in pairs. This will not only enhance the garage door but act as a visual deterent to any burglar looking for an easy target. Wooden front or back doors fitted with anything less than a 5 lever is an easy target. Insurance companies recommend 5 lever BS3621 as a minimum standard. If you just have a Yale lock fitted and either have lost the key to your mortise lock or don't use it then it is possible to open your door in seconds with nothing more than a thin bit of plastic. If this happens and your insurance company finds out they may refuse to pay up. Patio doors can be easy to get past. The locks fitted to the mechanisms are often fitted poorly, making them an easy target. Consider replacing the cylinders with snap resistant locks or high security secured by design door handles. PVC windows can be an easy target. Some can be levered open. Consider fitting sash jammers correctly to all windows that can be accessed without the aid of a ladder. Sash windows of the wooded variety can be prised open with little difficulty. Consider fitting some form of sash stopper as a means to secure your window. If your window is more than 1 meter wide then 2 locks should be fitted. Every one including the insurance industry thinks, that because your door has a 5 point locking or multi point locking system, then its secure as houses. This is not always the case. The locking mechanism fitted to the door is primarily just a 1 lever lock. It doesn't really matter how many hooks or dead bolts it has, its the lock or barrel cylinder that is going to stop a burglar or not. Consider fitting a snap safe high security cylinder. Avoid cheap imitations as these are snap safe but only once. As in the lock is snapped twice then pushed out of the way allowing access to the mechanism. Also the quality of the door plays a major factor in preventing access. Some people believe it or not actually choose to replace a composite door with a UPVC door. What a mistake. A cheap door is an easy target. In alot of cases you don't even need the key to open the door. A cheap door is mostly plastic. A good quality door would be fitted with a steel or aluminum skeleton giving it rigidity. So the cheap door is very spreadable and thus pops open. Just to clarify, we don't install windows or doors so this isn't a sales pitch. The garden gate plays a hugh role in preventing unlawfull access into your space. If you have a shed with tools in it. They could provide the nessessary means to gain entry into your home. To secure your shed consider fitting a good quality lock of saw resistant padlock. For the gate stay away from 1 to 3 lever rim locks as these provide little or no protection. It is possible to fit a BS lock to a garden gate or some form of security bolt operated with a locking cylinder. CCTV is a deterent and means of identifying a culprit who tries to enter your home illegally. Camaras shold cover all doors accessing your home and be fitted by a competent operator. Also consider running the system on a monthly recorded loop. When you hear an alarm what do you do? Some alarm systems provide a quick response time of up to 15 mins to get to your home. A burglar would probably be in and out of your home in less than that. Insurance companies may give you a discount on home insurance if you have one. Consider a wireless system. Easy to fit, High quality and compatable with your phone.